In the remote Kasai region of the Democratic Republic of Congo, 1.4 million people fled their homes during 2016/17 due to a full-blown regional conflict. By mid-2017, around half remained displaced, while those who went back to their area of origin were returning to burned and looted villages where they have no means to support themselves. The crisis in Kasai came on the back of ongoing conflict and intercommunal tensions across the country, where more than 4 million people are displaced from their homes, and over 7.5 million people do not have enough food to eat, an increase of 30 per cent over 12 months. 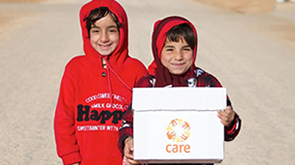 CARE is continuing to respond with emergency assistance to the ongoing crises. You can read the latest updates on our crisis watch page. What we have now are all the ingredients for a humanitarian catastrophe. If the international community doesn’t react quickly, it will be too late. But CARE is not willing to stand by as the hope of stability and development that the people of this fragile country have had in recent years is taken away. Before the crisis, CARE was one of the few agencies already working in the Kasai region. And our humanitarian teams are on the ground now, supplying clean water and food, helping provide shelter to those who have been displaced, and working to protect people from the violence. Read more in our blog Helping people in a conflict zone. Before the conflict erupted, CARE was one of only a handful agencies working in the Kasai region. We have been running a variety of health programmes as part of our longer-term development support to the people of the DRC. During the intense fighting that began in 2016, all parties to the conflict committed indiscriminate acts of violence against the civilian population. Women and girls were especially vulnerable. There is very little sexual and reproductive health support in Kasai, and almost no protection for survivors. CARE is training health workers in the holistic care and support of survivors of sexual and gender-based violence. Community mobilisers - volunteers also trained by CARE - spread the message about where to access these confidential services, reinforced by public service announcements on local radio stations. Many people are returning to their villages only to find their homes looted or completely destroyed. Most lack the resources to buy the seeds and tools to begin agricultural activities. In addition to services in sexual and gender-based violence, people urgently need food, water, sanitation, shelter and relief supplies. We urgently need more funds to enable us to reach and help those most in need. Since August 2016, the provinces of Kasai – formerly a relatively peaceful area – have been the scene of a violent uprising by a local militia group. The violence spread rapidly, and as the conflict grew in intensity, all the parties to the conflict began to commit indiscriminate acts of violence against the civilian population. Huge numbers are at great risk of violence, including sexual violence. Attacks against civilians are a daily occurrence. Children, largely recruited by the militia, have become hostages to the conflict. Thousands of children have been separated from their families and used as combatants, generating significant needs in terms of child protection. At least 1.4 million people in the Kasai region have been displaced from their homes and villages since the beginning of the crisis. Homes, schools, health centres, and infrastructure such as water supplies, have been damaged or destroyed. People have fled their homes with no belongings and no means of support. The situation has created a huge – yet largely unreported – humanitarian crisis. 2.8 million people (36% of the population) are in food emergency or crisis. The crisis in Kasai adds onto pre-existing crises in the DRC in the Tanganyika and Kivu areas. The total number of internally displaced people in the DRC is 3.8 million, the most of any country in Africa. 16 out the 26 provinces in the DRC are in a situation of conflict. Without funding, we can’t reach people. It means we can only reach a few of the millions of people who don’t have enough to eat. It means more children will go hungry. It means that not all survivors of the horrific sexual violence that marked the conflict in the Kasai will receive the help they need. 2017 was a bad year for the Congolese. 2018 will only be worse. Please donate today and show the people of the DRC that their suffering is not being ignored.